Spokane swimmers, prepare to party like it’s 1981. For the first time since that summer nearly four decades ago, all visitors to the six municipally owned pools won’t have to pay to plunge. The Spokane Park Board unanimously approved the change Thursday, a decision that is expected to cost the city roughly $200,000 in annual lost revenue but also bolster declining attendance at the city’s aquatics centers. “It’s about time,” said Sally Lodato, a member of the Spokane Park Board, introducing the proposal before the vote. 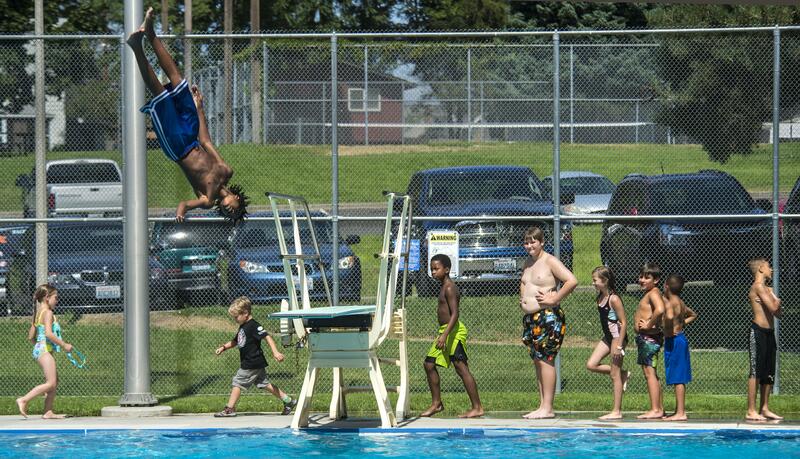 The city will save some money by eliminating the need for cashiers at area pools, who had taken the entry fees – $2 for children and $4 for adults – that have been in place since 2010. Swimming for children was free between 1983 and 2009, when the Park Board instituted fees to pay the estimated $1 million in maintenance needed to keep up new pools built with voter-approved bonds. Park Board member Chris Wright said before the vote that his approval was hesitant, because the department was essentially voting to take on the additional cost of running the program without a guarantee those expenses would be included in future budgets. “I think the reasons cited are all great ones, but it’s expensive,” Wright said. Leroy Eadie, director of parks and recreation for the city, said that factoring in the amount taken at the till and the savings on seasonal labor – which needed to be paid at the state’s rising minimum wage this summer – and the $15,000 cost to transport earnings by armored car, officials were basically voting to take a $150,000 hit each year to the bottom line. But, he said, that amount would likely be easy to find in future budgets, given the department’s increasing revenue. The city must also set aside 8 percent of its taxpayer-supported budget each year for parks expenses, an amount required by the city’s charter. That number has continued to rise with increasing city budgets, Eadie said. Eadie acknowledged the decision would potentially put Park Board members in a tough political spot if finances soured, which he didn’t anticipate. Jennifer Ogden, a member of the Park Board, said she supported the city eliminating the financial burden for families to attend area pools. The swimming season is scheduled to begin with lap swimming May 7 at Witter Aquatic Center in Mission Park, and June 18 at all other area pools. The city plans to refund those who had already purchased passes for the upcoming summer. Those wishing to lifeguard can apply through the city’s aquatics website.